Why Did Facebook Block UK Strike Site? Did Facebook intentionally block the website of UK-based labor protest organizers? The company denies the allegation, but UK activists aren’t convinced. Labor unions and student activists in the United Kingdom are organizing a massive strike of public workers to protest cuts planned by Prime Minister David Cameron’s Conservative-led government. They’re hoping to draw tens or even hundreds of thousands of supporters into the streets to join the workers in an across-the-pond version of the Wisconsin demonstrations that captured national attention n March. 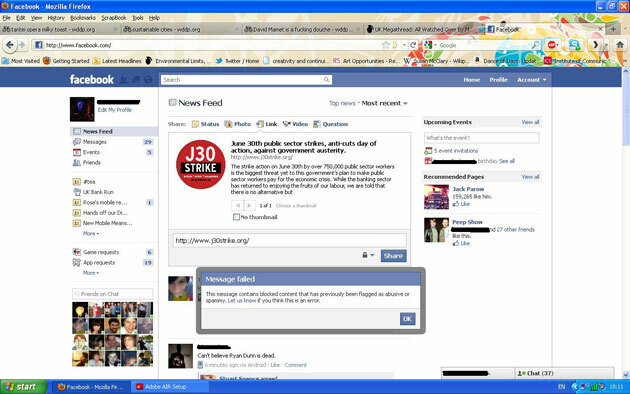 Screenshot of the error message received by people (including several Mother Jones staffers) who attempted to use Facebook to share a website promoting a strike planned for June 30 in the UK.UK-based activists had been receiving the error message for days before a US-based tipster contacted Mother Jones with the news via our scoop [at] motherjones [dot] com tip line. After confirming that my coworkers and I had the same problem, I contacted Facebook by phone and email around noon Eastern time on Monday. Sharing of the site was enabled almost immediately after my inquiries, but by 1:30 p.m., the site was blocked again. Around 3 p.m., I heard from Andrew Noyes, a Facebook spokesman in the company’s DC office. “The site was blocked in error,” he wrote in an email. “We’ve now unblocked it and apologize for any inconvenience this may have caused.” I emailed back to report that the site had been blocked again. I have yet to hear back, but the site was unblocked again by 5:30 p.m, and seems to be working now. The UK activists, meanwhile, believe something sinister may be afoot. 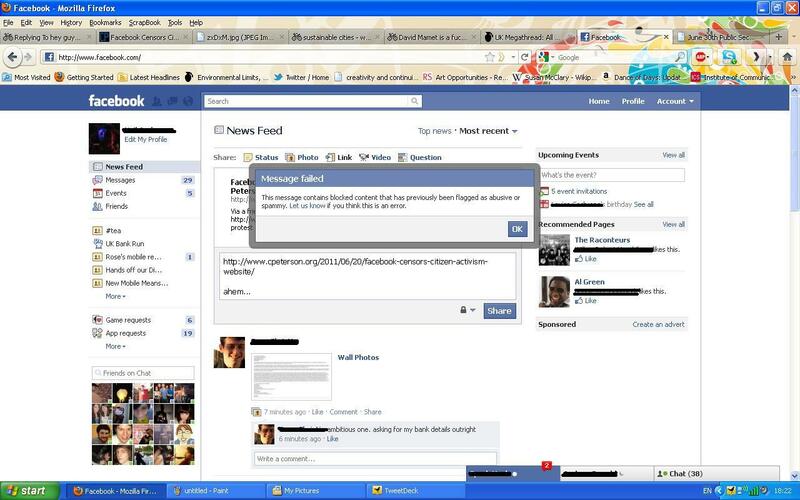 They note that Facebook also seems to be blocking sharing of a post by Chris Peterson, a blogger who first wrote about this problem. Several activists sent me links to a Guardian article reporting on claims that Facebook had conducted a “purge” of accounts run by UK student activists. The activists also noted that Facebook CEO Mark Zuckerberg has encouraged Britons to use Facebook to submit ideas about government funding cuts to Cameron’s government, and that Cameron and Zuckerberg conducted a video chat to promote the idea last summer. All that said, Facebook is now on the record saying this was an error. But as an increasingly important means of communication and social and political organizing, it’s important—for Facebook and its users—that the company be seen as a neutral party in debates over political issues. Ensuring that both sides of a debate have equal access to Facebook’s impressive organizing powers is part of that equation. If blocking the June 30th strike website really was an error, Facebook should make sure it stays unblocked—and take steps to prevent similar errors in the future. UPDATE: Chris Peterson, the blogger mentioned above, has written a follow-up post on this controversy. Check it out. This Week’s Dear Anna: Better Facebook Commenting?